Caw Fell is one of the more remote of the Ennerdale fells, sitting back from the valley above Silver Cove. Although it does have some crags, the overall impression is of a generally grassy mountain, lacking surprises. Its most dramatic features are the crags above Silver Cove and the crags above Bleaberry Gill, both facing north towards Ennerdale. Its south face forms part of the line of high ground around the head of Blengdale, also known as Stockdale Head. Caw Fell is one of those fells with indeterminate boundaries. The highest part of the fell is a ridge of high ground that runs west from Haycock, eventually dropping down into the isolated valley of Worm Gill. A second high ridge runs north from this first ridge, acting as the western boundry of Silver Cover. The summit area here lacks a name, but it is often refered to as Iron Crag, the name of the crag on its eastern slopes. Further north it becomes Ennerdale Fell, and the slopes heading down to Ennerdale Water are The Side, with Side Wood at their base. Having spent some time up here repairing the stone wall that runs along the top of this ridge, I feel that there is too much of a drop for it to be part of Caw Fell, so we won't be including it here. The views from Caw Fell are split in half by the wall, which runs past the south side of the summit cairn. The fell is slightly to the north of the line of fells that runs from Haycock to Pillar, so the north faces of these fells can be seen in a line heading east. There is also an excellent view of the almost empty valleys of the Bleng and Worm Gill. Caw Fell is a fairly remote summit. To reach it from Ennerdale cross Irish Bridge (the first bridge on the Liza above the lake), follow the track that heads south across the valley into the woods. Continue south through the woods as this track turns into a path. The path drops down to cross Silvercove Beck. This brings us onto the ridge between Silvercover Beck and Deep Gill. Turn right onto the path that runs up this ridge through thinning trees to a fence line. Cross the stile here and keep going south up the ridge until we reach the ridge between Haycock and Caw Fell. At this point turn right to climb up the final gentle slope to the summit area. It is also possible to reach the summit from Silver Cove, following roughly the lines of the the streams that rise at the western and eastern ends of the summit ridge - there are no paths here, but the terrain is fairly easy. From the south every route is lengthy. The fell can be reached from Blengdale Forest - follow the track through the forest towards Scalderskew Farm, then turn north-east to run up the ridge that climbs up to Caw Fell over Stockdale Moor. It is also possible to reach the summit from the west, although this is a very long walk. This route starts either at the entrance to Heckbarley, where volunteers have been planting a new disidous forest, or near the Kinniside Stone Circle. From the stone cirle head south along the Cold Fell Road to find the start of the old mine track, turn left and follow it across the western slopes of Blakeley. From Heckbarley follow the forestry commission track. The two routes merge after about a mile. At this point look out for a rough track that branches off to the left from the more obvious forest track. Follow this rough track past a radio mast and along the southern sides of Grike and Crag Fell. Eventually this brings us to a point where a side track branches off to the right (not suitable for vehicles, although I have been driven as far as this point). Turn onto this track which cuts across the valley between Crag Fell and the Side, crossing some clear-felled forestry. On the far side of this we reach the open fellside. Follow the stone wall that runs south-east up the opposite slope, and keep going all the way across Iron Crag/ The Side. The wall eventually drops down the far end of this fell and joins another wall/ fence line. Turn right here and follow this boundary line onto Caw Fell. At the top of this climb turn left to reach the summit. None of our walks visit Caw Fell. The summit area is a gentle grassy plateau, split in half by a stone wall. The highest areas feel rather wild, although the western end, where the wall turns north, feels surpringly pastoral. Look out for some upturned hanging baskets that have been placed up here to try and encourage wildlife. Silvercove Beck rises on the north side of the fell, and it or one of its sources forms the boundary between Caw Fell and the ridge up from Ennerdale, which really belongs to Haycock. 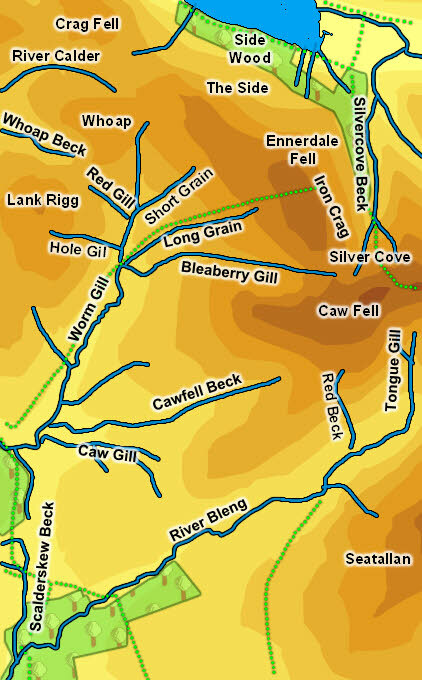 Bleaberry Gill forms the north-western boundary, flowing west between Caw Fell and Iron Crag, before joining Worm Gill. Worm Gill flows south/ south west, and forms part of the western boundary of the fell. Caw Fell ends in this direction where Worm Gill turns west to run beween Swainson Knott and Lank Rigg. To the south the River Bleng forms most of the boundary. Tongue Gill forms the boundary between Caw Fell and Haycock here, flowing south to help form the Bleng, which then flows south-west past Caw Fell and Stockdale Moor. The boundary between Stockdale Moor and Caw Fell is formed by Caw Gill, which flows north-west then turns west to flow into Worm Gill. Cawfell Beck belongs entirely to the fell. It rises to the south-west of the summit ridge, and flows west into Worm Gill, joining it just above Caw Gill.